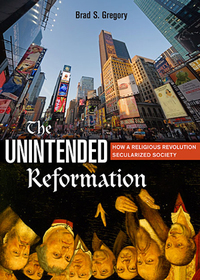 Brad Gregory, director of the Notre Dame Institute for Advanced Study and Dorothy G. Griffin Professor of Early Modern European History, received a 2018 Expanded Reason Awards honorable mention for his book, The Unintended Reformation: How a Religious Revolution Secularized Society (Belknap Press, 2012). Organized by the Francisco de Vitoria University (Madrid) and the Joseph Ratzinger/Benedict XVI Vatican Foundation, the Expanded Reason Awards aim to recognize academic achievements that advance Pope Benedict’s proposal to widen the horizon of reason. The awards are distributed in both teaching and research categories, with Gregory receiving honorable mention for his research. John C. Cavadini, a Notre Dame professor of theology and director of the McGrath Institute for Church Life, led a team of four colleagues from Notre Dame that won an award in the teaching category. 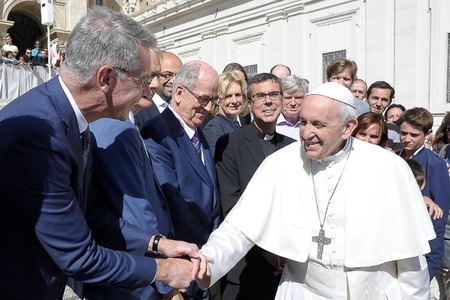 The prize-giving ceremony took place on September 24, 2018 in the Casina Pio IV, home of the Pontifical Academy of Sciences, in the Vatican Gardens. The celebration occurred in conjunction with an international symposium focused on the possibility for dialogue among science, philosophy, and theology in university communities today. Winners of the Expanded Reason Awards were invited participants during the conference and had the opportunity to meet Pope Francis after the weekly papal audience, on September 26. The NDIAS supports research that is directed toward, or extends inquiry to include, ultimate questions and questions of value, bringing together leading thinkers from around the world to live and work at the University as fellows in a residential intellectual community. These cross-disciplinary scholars, scientists, and artists pursue innovative research projects as they engage and contribute to the research of Notre Dame colleagues and students from multiple disciplines, augmenting the life of the mind on campus.